People say there's nothing going on in the Outer Richmond. For the most part, they're right. I live out there and I'll be the first to tell you that there are a lot of houses, a lot of dogs, and a lot of people walking their dogs. Sure, we have a few small neighborhood bars where you can watch a ball game, a couple cool cafes, bakeries, and restaurants, and we even have a beachfront Safeway! (which is more than the folks in fancy Noe Valley can say) but who's counting beachfront Safeways? I admit, the Outer Richmond can sometimes feel like San Francisco's moldy spare bedroom, but one thing we do have out in this sleepy land of perpetual foghorns is the Historic Balboa Theater. The theater opened as "The New Balboa" in 1926. 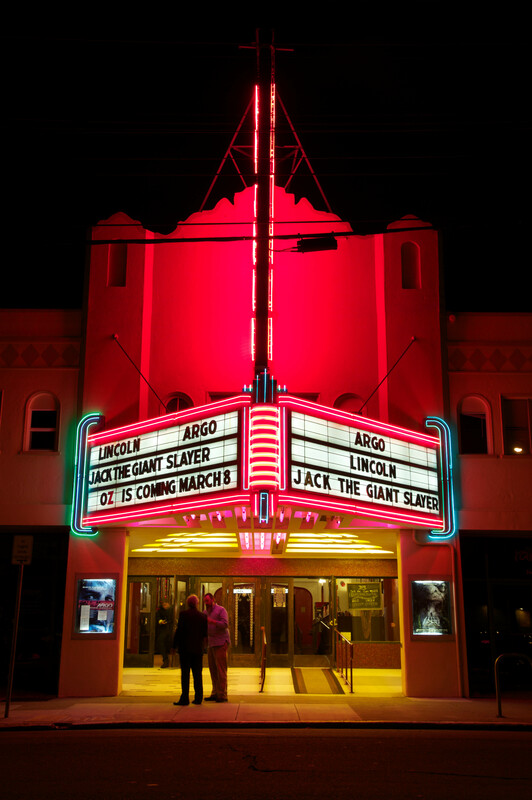 Originally a single screen theater, it split into a two-screen "Miniplex" in 1978. The building was designed by the Reid brothers, who also designed The Cliff House, the Spreckels Temple of Music in Golden Gate Park, and several other old San Francisco theaters, including the Balboa's Inner Richmond counterpart The Alexandria, which shut down in 2004 and has since become somewhat of a haven for crackheads and bums. 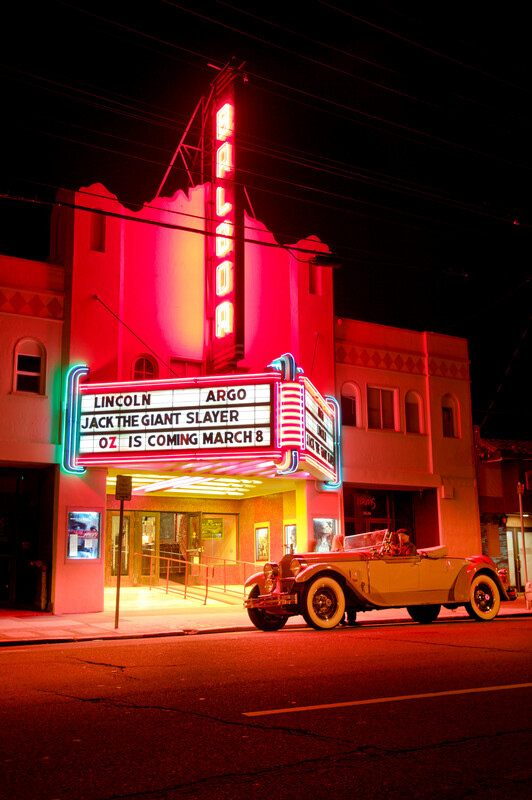 The Balboa itself faced closure in 2001, but was spared the same fate as the Alexandria when new owner Gary Meyer took over and vowed to keep the Balboa in operation. He said “I just can’t let another old theater close. This is an incredible neighborhood of family restaurants and businesses and our audiences appreciate the personalized attention we provide.” I guess he’s right; it is an incredible neighborhood. I love the Balboa for a lot of reasons. One, it feels like an old theater, even on the inside. When you walk through the big glass double doors into the lobby, there’s no arcade room off to the side buzzing with snot-nosed kids playing Duke Nukem. Save that stuff for the bars and billiard halls. Instead there are old and new movie posters lining the walls, a wide carpeted lobby, and an old bar with a snack stand. The Balboa is classy. 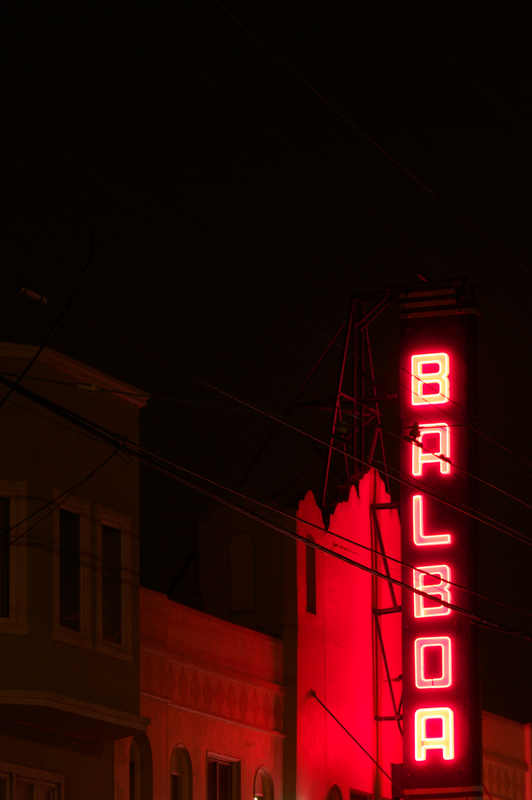 Also, the Balboa just looks great. In the darkness when the nighttime fog settles over the houses, it's always good to know that on Balboa Street between 37th and 38th the big red sign will be blinking, incessantly spelling out its own name. B-A-L-B-O-A. Incessantly at least, until midnight when the last movie lets out and they close up shop. But that's the nature of the Outer Richmond. You can't leave the bedroom light on all night. 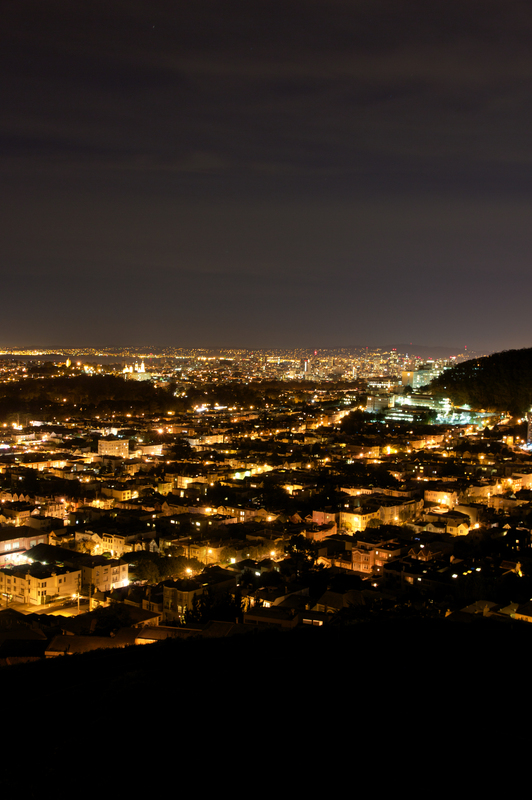 On a warm night last week I took a midnight trip to the top of Grand View Park to photograph the lights of San Francisco's Outer Lands. 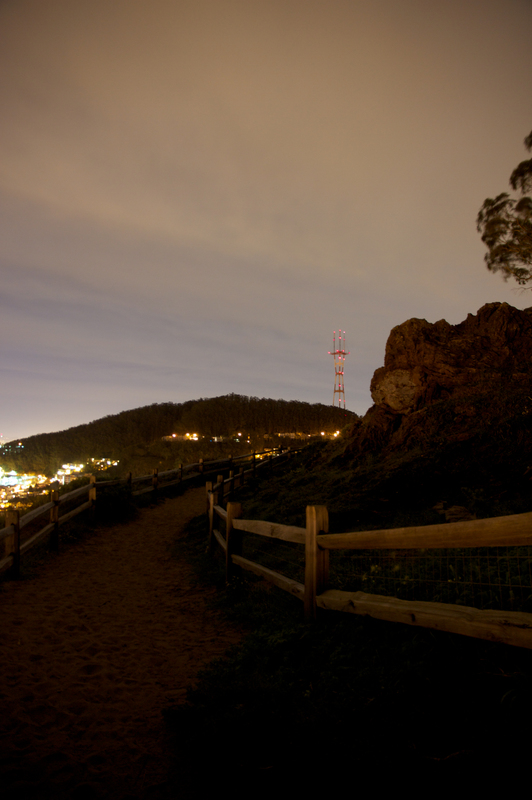 I mentioned Grand View Park in a previous post about The Moraga Steps, but I'd never been there after sunset. It was a little cloudy that night so there were no stars, though with the light pollution I doubt they would have showed up anyway. 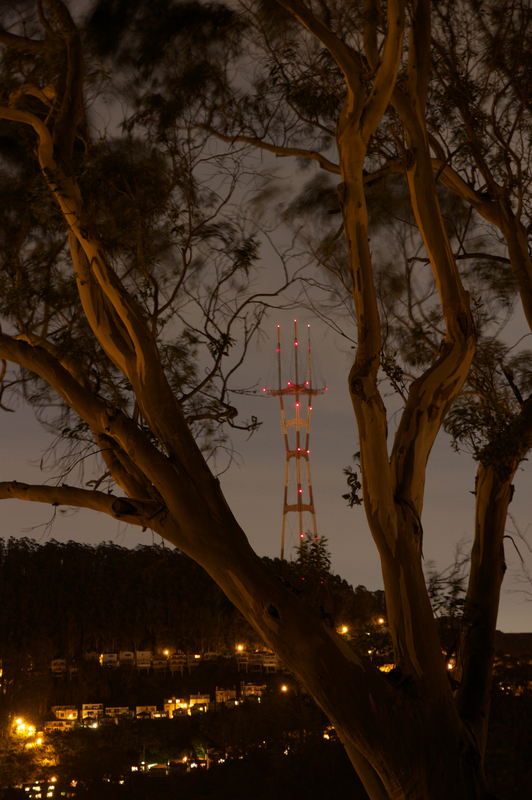 Sutro Tower through the Eucalyptus trees. Most of the little neighborhoods in this part of the city are quiet. Tucked into the back corner of Mt. Sutro, this one (the back end of Golden Gate Heights) especially feels like its own private community - a tiny town cut out from the rest of the city. 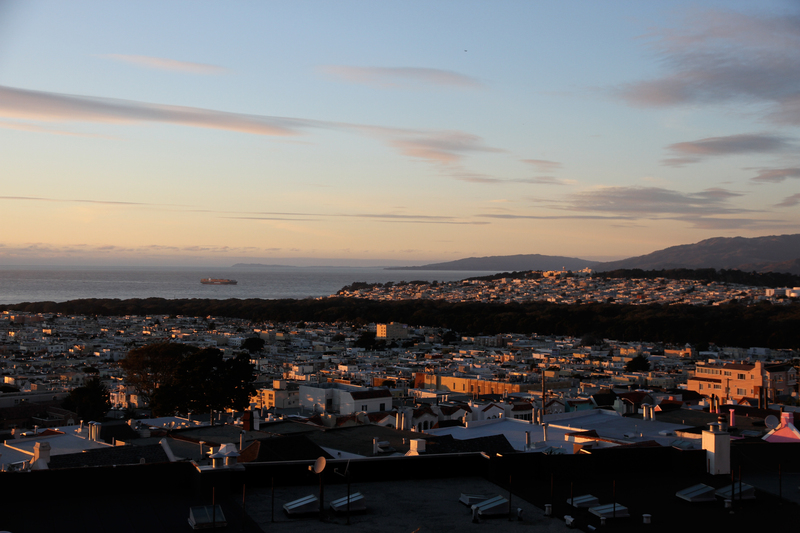 The view of the Inner Sunset, USF, Downtown, and all the way across the bay to the Oakland Hills. 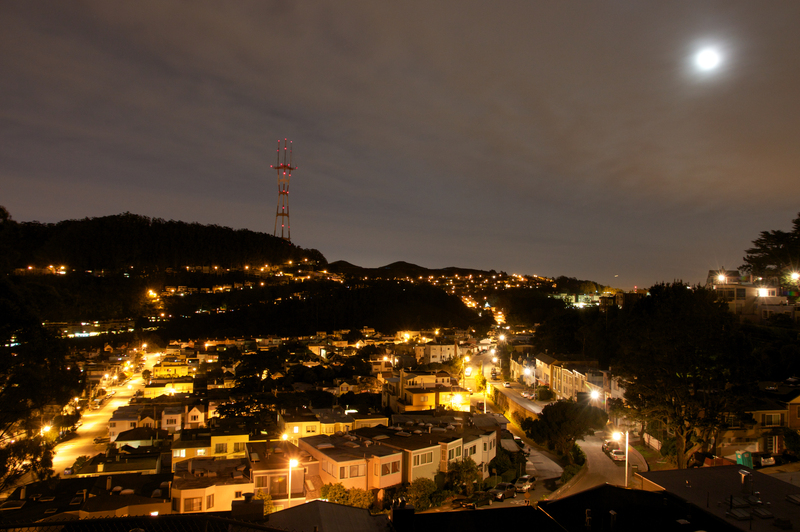 Sutro Tower in the moonlight. Moraga Street headed west into the Outer Sunset towards Ocean Beach. The Outer Lands aren't known for being particularly hip. People don't flock to the Sunset like they do to North Beach or the Haight. A lot of the time the Outer Lands feel more like suburbia than a city. 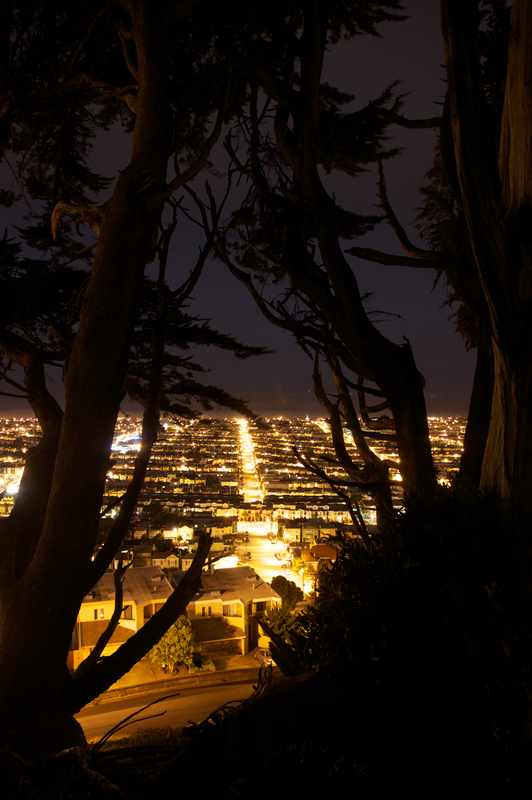 But from the top of Grand View Park, when the city grid lights up in the darkness and you can see the glowing streets spreading out in every direction, it feels like San Francisco. 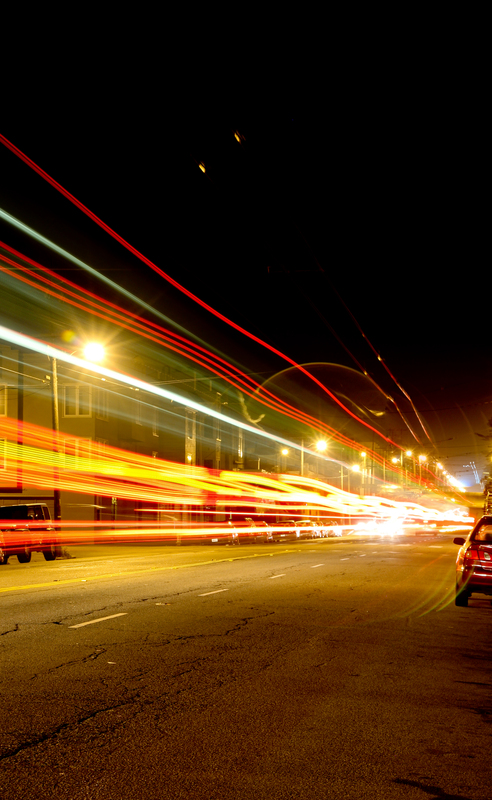 I'm hoping that posts featuring photos in and around San Francisco will turn into somewhat of a series on this blog. I've lived in the city for almost a year and I regret that I haven't taken advantage of the great photographic opportunities so close to home. I think part of this is my own aversion to looking like a tourist in my own city, but that's really something I should just get over. 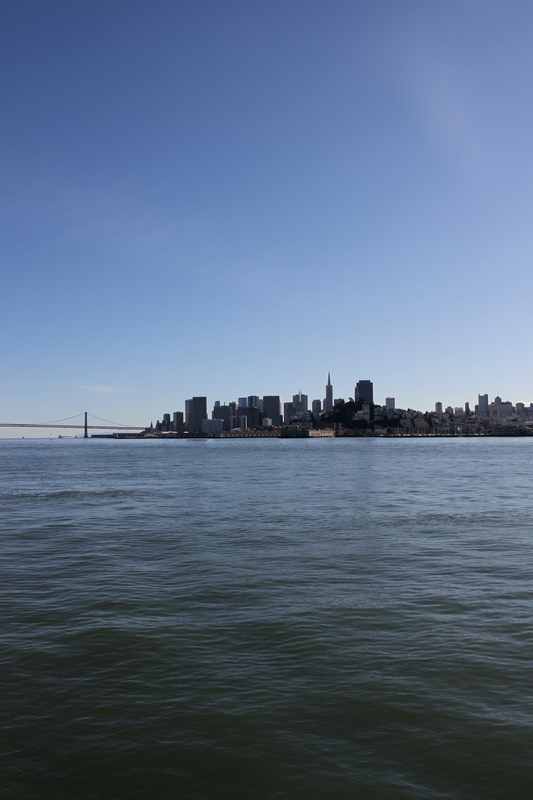 That being said, here are a bunch of touristy photos of San Francisco. As a gift for my birthday last year, my parents bought me tickets for the Red & White Fleet's Bay Cruise. It's not something I would have bought myself, since it's sort of a cheesy tourist thing (it takes off from Fisherman's Wharf, the worst tourist trap in the city). But we went in the off-season, avoided the crowds, and pretty much had the whole ferry to ourselves. 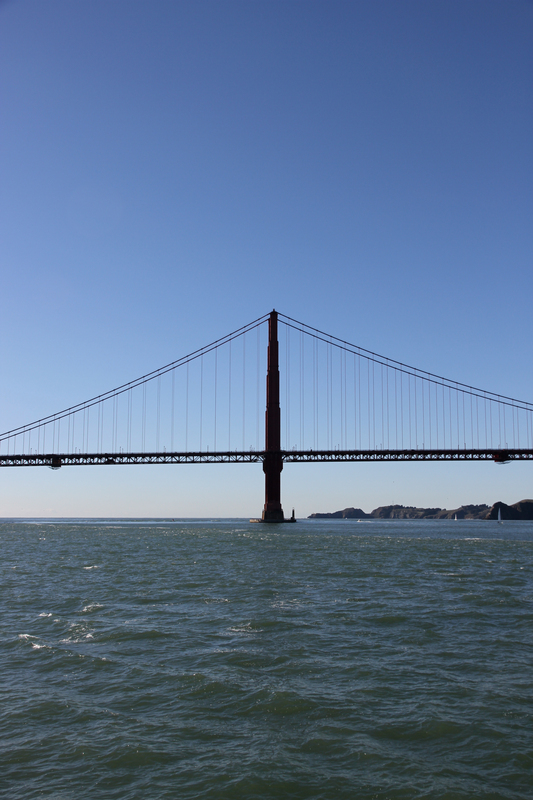 The best thing about the Bay Cruise is that it takes you under the Golden Gate Bridge. 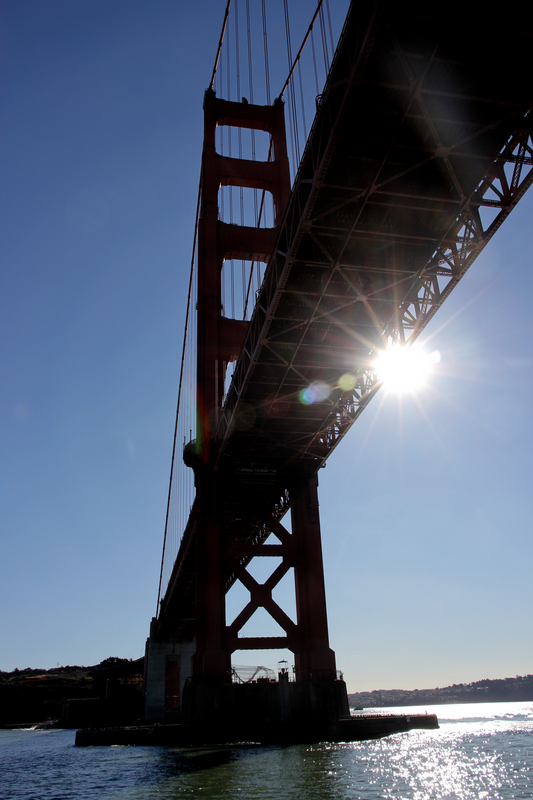 It does other things, like go near Alcatraz and Angel Island, but really it's all about the bridge. There was an on board audio tour, which was informative, despite the fact that it was a little over-performed. The lady on the recording kept waxing poetic about things we were likely seeing: "Look to your left, see any smoke? Once Native American tribes lived on those shores. Two hundred years ago the smoke from their campfires would have wafted over these waters." Sorry lady, no smoke. I had a hard time buying into the nostalgia. But there was nothing corny about the views. Somewhere along the way I turned the lady off and enjoyed the day. We got lucky with the weather. No fog, no wind, and a calm bay. 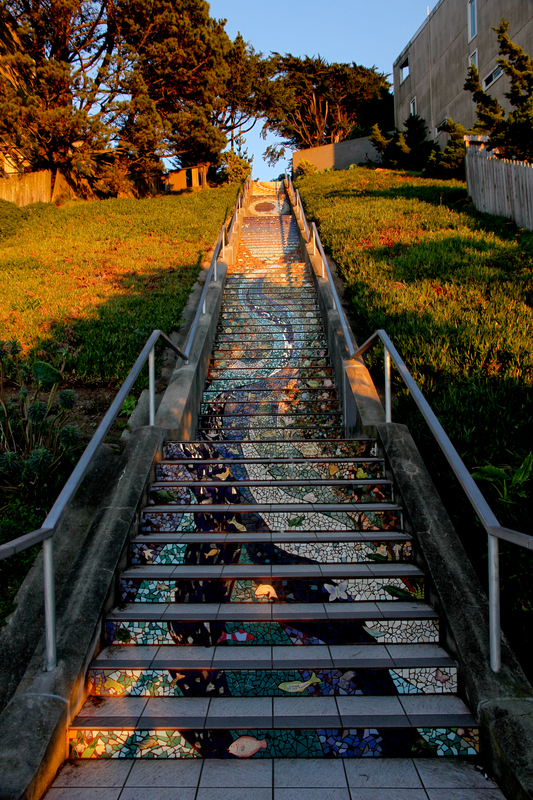 These are the Moraga Steps. 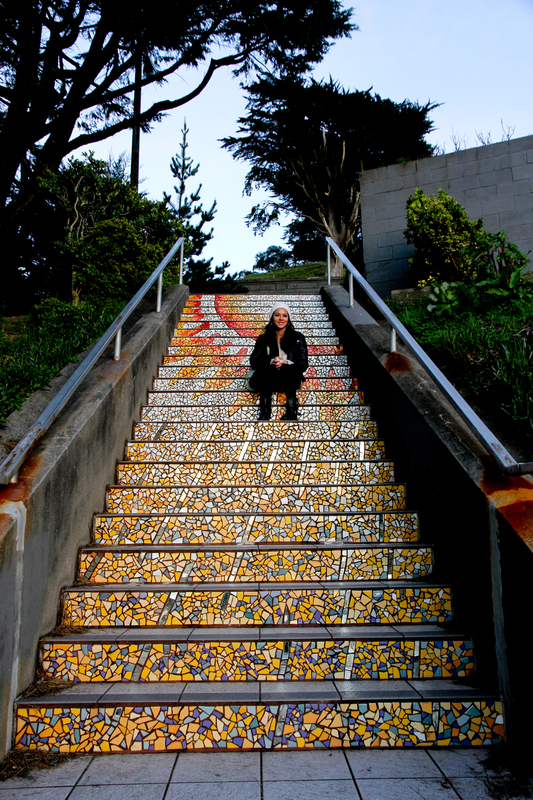 Far from the tourist-laden shores of Pier 39, these steps are the result of a project put together by the local neighborhood in this part of the city (Golden Gate Heights/Inner Sunset). Contributions from the local residents and a generous offering from the city of San Francisco itself helped fund the work. 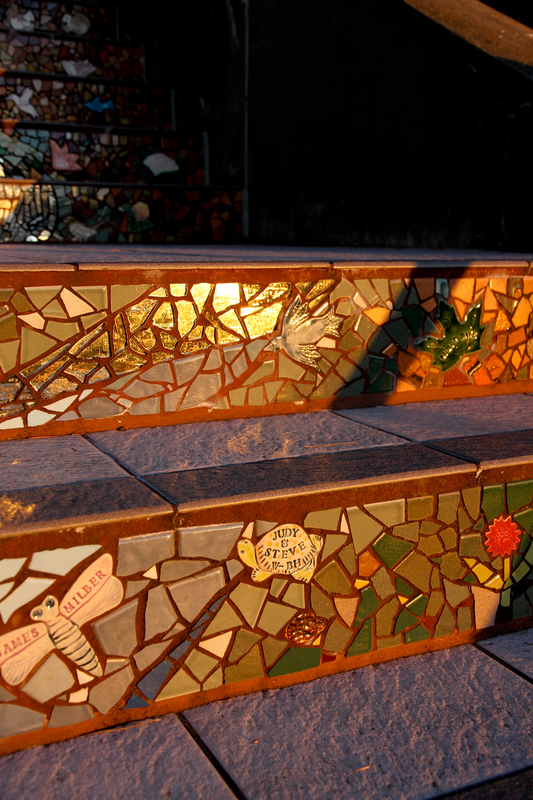 The names of donors and local families can be found scattered on various tiles throughout the mosaic. 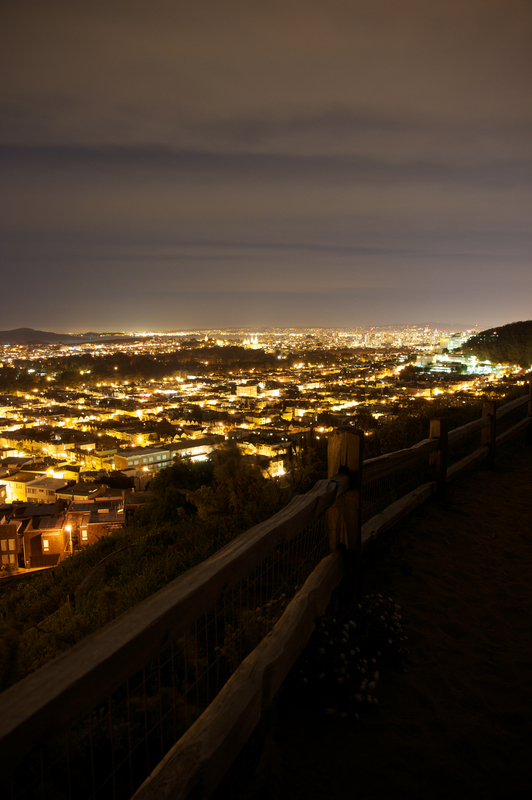 The steps lead up to Grand View Park, which as the name suggests, has one of the best views in the whole city. From the top of the hill at Grand View you can see downtown to the Transamerica Pyramid, north to USF, the Presidio, and the Golden Gate Bridge, and west to all of San Francisco's outer lands. On the day we were there it was particularly clear and we could see all the way north to Point Reyes, where Sir Francis Drake made landfall after inadvertently sailing past the Golden Gate on his way up the coast. 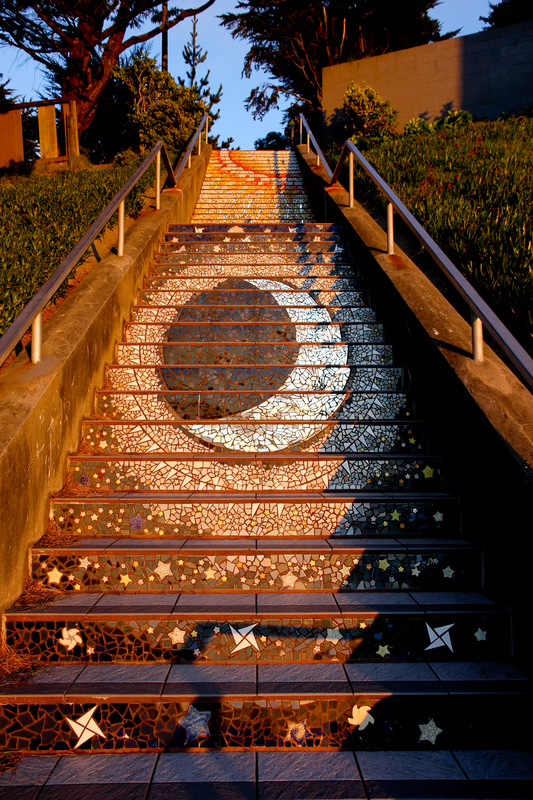 Of all the mosaic patterns I liked this one (The Moon) the best. But Beth preferred the sun. The Bay Cruise was fun and it was interesting to be able to sail under the Golden Gate Bridge; but I think it's the smaller, lesser-known parts of the city, like the Moraga Steps, that make San Francisco great. Hopefully there will be more San Francisco photos to come. Shot from USF campus at Lone Mountain. 2700 block of Turk Blvd. Without a powerful telephoto lens it's difficult to capture the moon in crisp detail as it is too bright, but for these shots I think the blurred orb is fitting.